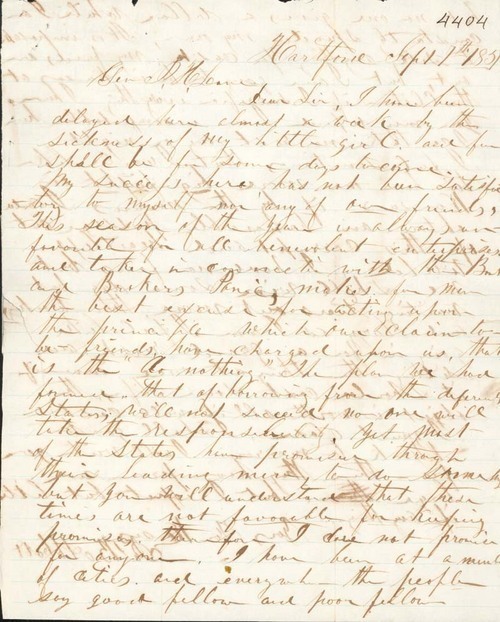 James Abbott wrote from his travels in Hartford, Connecticut, to James Lane, General of the Kansas free state militia. Abbott was attempting to raise money and supplies for the free state cause by soliciting donations from supporters in the East. However, he reported that "this season of the year is always unfavorable for all benevolent enterprises" and that the "bank and brokers panic" was making matters even more difficult. Abbott longed for "one more big fight in Kansas" even if it should cost him his life or the lives of others as "the object is worth all it will cost."